Marketing for Dummies the book should actually be called marketing to dummies. I was making pizza for my children a while back. 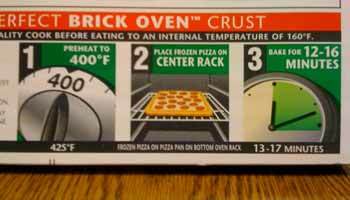 I’ve made pizza many times before – but this time I actually studied the instructions on the back. The biggest thing that struck me was how SIMPLE the instructions were. Lots of visuals – big letters – and only three steps. ANYONE – even if they can’t read – could bake this pizza. And it struck me… the problem with almost all marketing is how complicated it is. Today I got an email from a friend advertising a coming event he was hosting. I visited the website but couldn’t find the date of the event anywhere. I got frustrated and clicked away. Complicating your marketing is stupid. You will lose customers just by making their life difficult for them. Instead – dumb things down. Assume your audience needs every step explained to them in detail. The goal of your marketing is to remove ANY possible confusion or friction that could cause someone NOT to buy from you. Be prepared to go all the way to your customers or potential prospects. You are asking them to subscribe to your email list or buy something from you. You need to take the initiative and meet them on their terms. Remember – they are constantly asking the question “What’s in it for me?” Be prepared with a well crafted answer. One of the best ways to reach out to your market is to overexplain. Don’t assume that they know the technical jargon your company uses. Don’t assume that they know who to call or what to ask when they do. One of the best pieces of advice that the late Gary Halbert suggested was to get VERY specific with what a customer can expect when calling your phone. He recommended letting them know the name of your receptionist – what color sweater she wears – and how her voice will sound. It’s these details that put customers at ease and allow them to feel like you’ve got the details handled. Most people have about a 5th grade reading level. Write your marketing materials with this in mind. Repeat important instructions or any calls to action. If you have a sales letter and you are asking prospects to do something – be certain to ask multiple times during the letter. Repetition is important. Have you ever tried to assemble a product without a diagram and only written instructions? Next time you order from Ikea – try it. It’s hard to do. Add in a few pictures and people can SEE what you mean by the written instructions. Imagine how powerful your marketing would be if your customers could access your information, products and services without any friction.